I grew up in a house where a salad for dinner was like a mountain of vegetables, lunch meats, and cheese. While I may not chop up the entire contents of my refrigerator to go in my salads anymore, I do intend on eating a salad that’s actually a meal and not a starter. I even made the salad dressing, instead of store bought version, which Frank wasn’t totally impressed with. He kept stating that it tasted like cream cheese, but I can assure you – there was absolutely no cream cheese in my buttermilk dressing! Just Greek yogurt, buttermilk, dill, parsley and garlic. I may have to work on the recipe a bit more, so I’m not posting it. 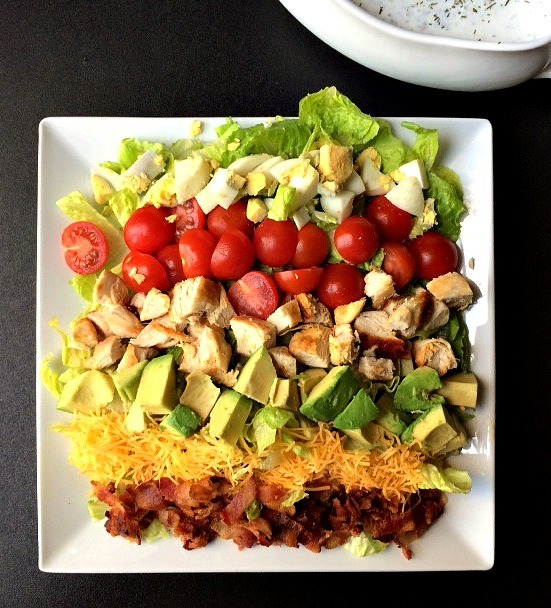 Place the romaine lettuce on a large-ish plate (this salad is quite large)! Put each of the toppings in a stripe pattern op top of the lettuce. Top with ranch dressing (either a home-made version or whatever store bought version you have).